I signed up for the Mask-erade online class. I played along day #1 of the class. 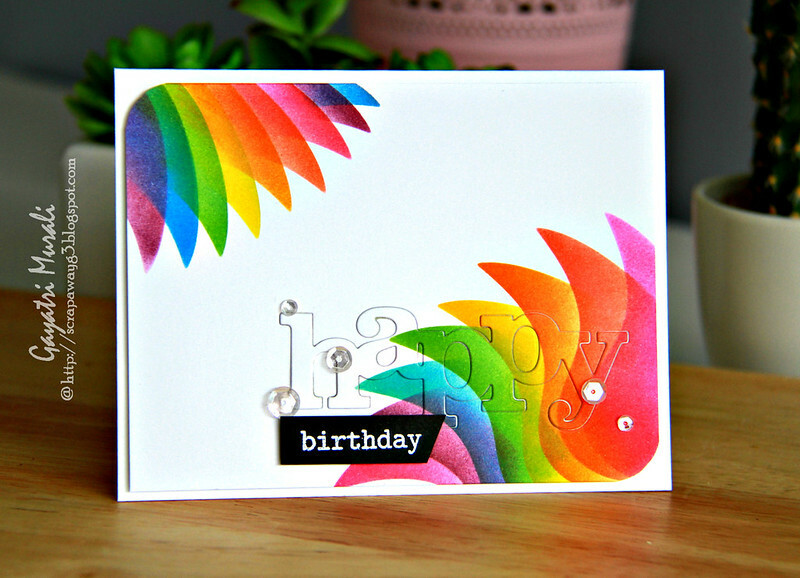 I have always loved Laura’s rainbow cards using masking technique. Her cards are amazing! Swoon! Drool! lol! So far I have been a bit scared trying out her technique but after watching her video at the class, I gave it a try today. Here is my card. I am so thrilled with how it turned out. I LOVE this technique. 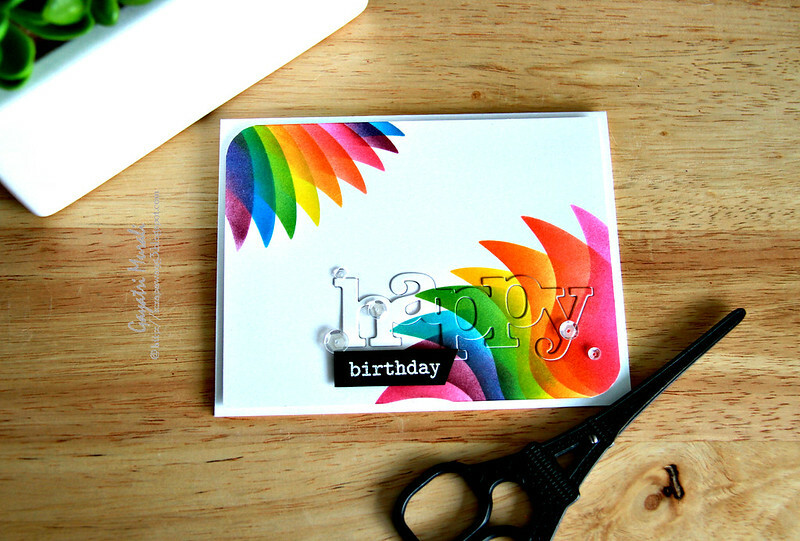 And how quick and easy to create and give such a huge impact.You will see more rainbow coloured card using masking technique from me 🙂 Thanks Laura for sharing the technique and for the fantastic video as well. The die cut and sentiment is from Winnie & Walter. The die is called In A Word: Happy Cutaway and sentiment is from The Big, the Bold and Happy stamp set. I then used Sparkly Clear sequins from Pretty Pink Posh. I have another card share for day #1 but for now this is it. I am feeling much better today. Fever is under control and sneezing bouts have stopped. Throat is buggered but as long as my eyes are not watering and I can focus, I can get around doing work. Hate not able to do anything. Anyway, I am on the road to getting better. This looks great! I love the way you used opposing corners! Jaw dropping gorgeous Gayatri. Your use of the bright colours is amazing . I'll be pinning this one ! 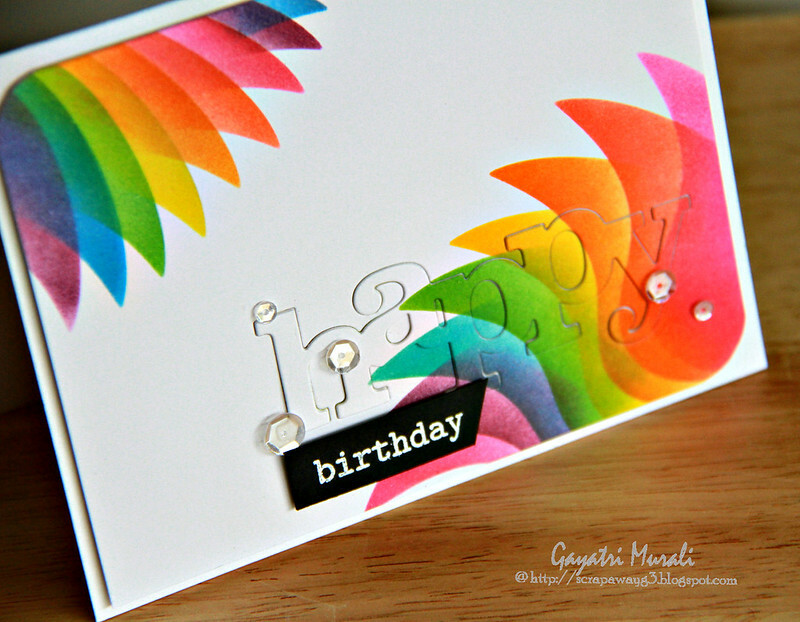 So glad you are feeling a little better, your card is AMAZING Gayatri! Thud. Really gorgeous, Gayatri! I'm glad you're feeling better. What an absolutely gorgeous card Gayatri ..Love it !!! Fantastic!! A great take on Laura's card….LOVE Love Love! I always adore your work…super talented!! Glad to hear you are getting better. Yes, that's the most annoying – not being able to do anything because of sickness> Your card is gorgeous and so festive! So stunning, Gayatri! I guess I'd better catch the next set of classes, huh? So glad to hear you're on the mend, Sistah!